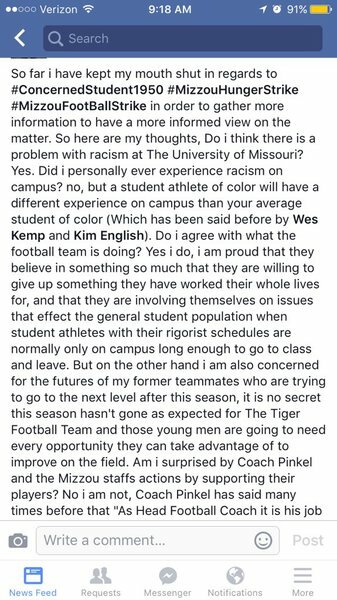 University of Missouri System President Timothy W. Wolfe resigned on Monday during am emergency Board of Curators meeting following weeks of protests over his leadership, a hunger strike from a graduate student and a boycotting football team. Shortly after, Jonathan Butler, the Mizzou graduate student who said he had gone more than a week without food, announced his hunger strike was over. Mizzou football players confirmed to Post-Dispatch beat writer that they will resume practice and play BYU on Saturday. Mizzou players are expected to speak to the media Monday afternoon during the team's media day, where they will make their first public comments since they announced they would boycott football activities in support of Butler's hunger strike. Huge thanks to Coach Pinkel, the rest of the coaching staff and our Mizzou family for supporting us in this movement!